Esther A. Benninghoff, daughter of Robert and Kate (Christian) Eickhoff of Fairmont, Minn., started her remarkable journey of 102 years, 10 months and seven days on April 12, 1908. Esther died peacefully on Feb. 19, 2011 with family nearby. She was preceded in death by her husband, John G. Benninghoff, in 1972. She is survived by her children, George (Pat) Benninghoff, Ted (Diane) Benninghoff, Katie (Lairie) Stabler and Joann Erspamer; six grandchildren and six great-grandchildren, the youngest having come into the world just days after her passing. Arriving in Aspen in 1946, Esther and John helped build a community. But she considered her greatest accomplishment to be her dedication to her family. Her heart and home were always open to love and laughter…and a hearty meal. 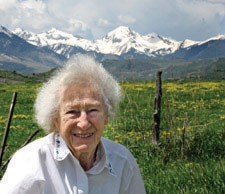 A Celebration of Life service will be held at the Aspen Community Church on Saturday, July 16, 2011 at 2 p.m.
Esther will rest next to her husband, John, in Red Butte Cemetery, among the many neighbors and friends who enjoyed and endured and loved Aspen, as did she and John. For those who wish, memorial gifts may be made to the AR Chapter of P.E.O., the Aspen Community Church or the Aspen Historical Society.